I have an Exciting Announcement!!! 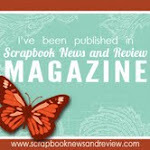 If you are looking for the KCC Scrap Your Man Blog Hop, please go HERE!! 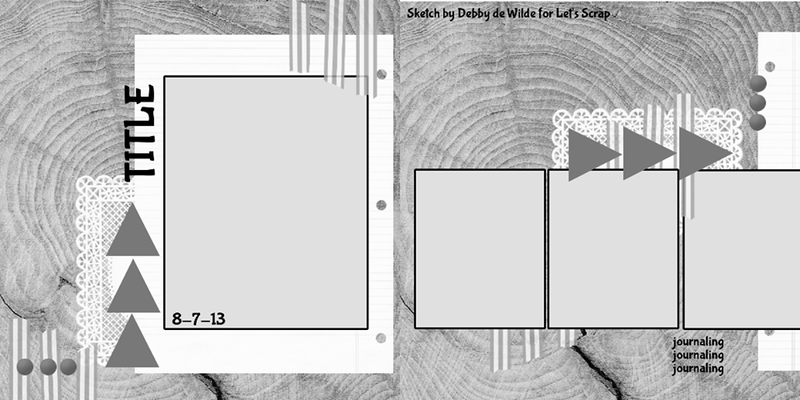 I submitted these layouts to the Let's Scrap Design Team and was selected to be part of their team! 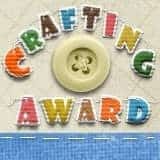 This is a NING site and I was amazed at how many crafters belong AND how many countries are represented!!! I am honored to be part of this sketch challenge DT and community!!! If you love sketch challenges, come check us out HERE!! Here was the sketch. We were able to do one or both as our entry. I love creating 2-pagers (my only OCD trait) so I chose both. I turned the left page on its side to fit my picture. My layout celebrates Tyler's team winning baseball Districts this spring. I also got to play with my new toy - a Zink hAppy! I printed out these photos from my tablet and punched them with my circle punch. I used my Fiskars 1.5" circle punch for the photos, and my The Paper Studio 1.75" circle punch to make photo mats out of cardstock. Here are the circles - I pop-dotted the photos onto the mats. I tucked a line-up card behind the photos. Since these layouts are celebrating the Team, I included some of his teammates in the circles! Tyler is at the top in his catcher's gear. I embossed and inked a paper lunch sack and added a vinyl title that I created on my Cameo. I pop-dotted a paper ticket at the bottom of the layout. Sadly, I don't have many more photos to scrap of this incredible team as they are all in college or the Marines now! It was a great ride boys!!! 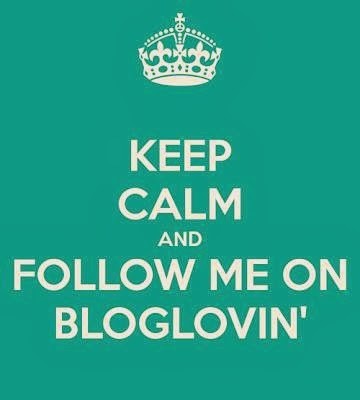 Welcome to the My Man Blog Hop! We are celebrating the men in our lives - Husbands, Fathers, Brothers and other significant men. Today I am celebrating my husband. We have been married for just about 21 years. We have 3 boys. We have had our ups and downs and most recently a cancer scare. Mike had surgery last month to remove a kidney after it produced the second tumor within 5 years. We had the tumor removed 5 years ago and left the kidney intact. A second tumor started growing, so we removed the entire kidney. Everything was contained in the tumor and several scans came back clear! Surgery was rough on him, but he was very determined to do whatever it took to get better. He was in the hospital 7 days. I stayed pretty much the entire week. It is amazing how your outlook on life changes when dealing with a serious health issue! We are very lucky as no further treatment is necessary at this time - just scans to watch for the rest of his life. You should have arrived from Love 2 Create. If you found me first, hop on over to the BEGINNING so you don't miss anything! You will find some awesome "Manly" projects! My husband was the class president at Papillion La-Vista High School and graduated in 1988. His class celebrated their 25th Reunion in August. He had surgery July 8th and was not sure if he would be able to enjoy his reunion this time. We skipped the Friday night bar event as he was afraid he may get bumped or squished in his incision. We heard that was a wise move for Mike as the bar was very crowded! We enjoyed the dinner Saturday evening - stayed until 9:00 when he ran out of gas!! One of his classmates took this picture of us and another couple after dinner. It was good to see him smile!! I used my Silhouette Cameo and some images from the Silhouette Online Store to design my layout. 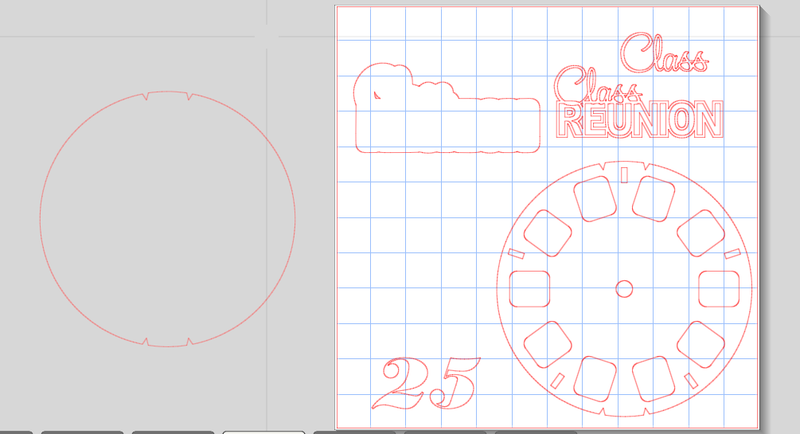 I created a shadow for the title "Class Reunion" and also cut a second "Class" in maroon. I also copied the View Master card and ungrouped it. I grabbed the outer circle and deleted the rest. This gave me a background piece that I cut in black. The 25 came from a font from my computer. I thought it looked a little retro! I used a piece of Graphic 45 maroon patterned paper for my background page. Maroon and gold are his high school colors. I assembled the title layers and inked the shadow layer. I found these tickets (a border strip that I have had forever) and cut a set of two for my journaling tag. I used a piece of bright blue cardstock to mat the photo as it matched Mike's shirt. I cut a strip of ABC paper from DCWV The Timeless Type Stack, inked it and adhered it to my background paper. I layered the View Master card, photo and 25 on top. I added a piece of ribbon that has ruler markings on it found at Michaels in the dollar bin. I printed out a 2x3 photo of the cake on my Zink (Zero Ink) mini printer. I mounted it on maroon cardstock and pop-dotted it over the top corner of my main photo. Is it weird that I have not been to a single reunion of my own, but have been to 3 of Mike's? I did not meet Mike until 1990 and did not know any of his classmates until the first reunion. They are a bunch of fun people! So glad you stopped by! Please head over Paula's BLOG for the next stop in our Blog Hop! 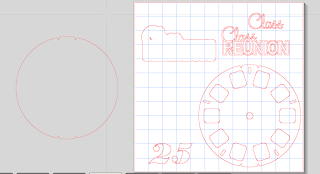 Our current challenge at Frosted Designs is NUMBERS! You need to have numbers on your project which can be a card, layout or off the page creation. I chose to create a laytout of Tanner's First Day of 2nd Grade. I started with some images I purchased in the Silhouette Online Store. I cut these images out in red, white, green and black cardstock. In addition to the Numbers challenge, I am trying to use more than one piece of patterned paper on my layouts - very scary for me!! Because the papers are so busy, I wanted the embellishments and title pretty simple. I also trimmed the pages a bit and mounted them to a piece of red cardstock, and put a 2" black border in between the two sheets. 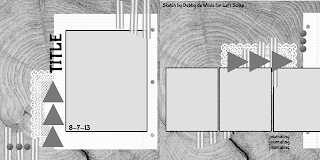 I sized the title to be 6" wide. I assembled it and overlapped the black border just a bit. I tucked the First Day banner behind one of the photos, along with the red arrow. I wrote a little journal strip using lots of numbers! We live 2 blocks from Tanner's school and walk him most days. I love this shot of Mike and Tanner walking ahead of me! I hope you join us at Frosted Designs with your numbers project!! I am finishing up my Disney 8x8 album. Before we go to Disney, I make an autograph album. As Tanner gets older, he is less interested in standing in line for Character autographs and more interested in riding rides and doing activities. We also try to do one new activity each time we go and this year we are doing two!! Riding in a hot air balloon (you can see my Hot Air Balloon page HERE) and going bowling in Downtown Disney at Splitsville. I used a great product for my titles - Square 1 Masterpiece Repositionable Adhesive Backed Fabric. This is a very safe alternative to Vinyl (which is full of PVC) and can be printed on, painted, punched and cut!! You can find out more information or order some of this HERE. I googled Splitsville and found a photo of the outside of the bowling alley. I printed it out onto Square 1 Masterpiece Repositionable Adhesive Backed Fabric. I let the ink dry for a minute or two and trimmed it with my paper cutter. Here is a close up of the printed photo - it is very vibrant. I am low on black ink and was worried it would not come out. I stuck the photo down onto a piece of red carstock. I used Nifty Fify and my Gypsy to weld the word Splitsville and cut it out with Square 1 (the same sheet that I cut the photo out of). I used the same settings as when cutting vinyl (speed 3, pressure 3 and blade 3). I weeded the extra pieces with my fingers. I used transfer tape since I wanted the title to be straight. The "S" was not welded to the rest of the word and I wanted it lined up properly. I burnished the image and peeled away the transfer tape. I wanted to add something next to the photo, so I used the Split from Nifty Fifty. Again, I cut it out of Square 1. This time I did not use transfer tape since it was all one piece. I stuck it down like a sticker. Here is a sneak peek of the photo and dried stickles. I love this layout!! I had one piece of this bowling paper left over and I am really a 2-page scrapper. I cut the paper to two 6x8 pieces and mounted on and 8x8 piece with a black border. I added the red mats (4.25 x 6.25) for the photos I am sure I will take!! It will probably be hard to select just two!! Many of you know that my middle son Tyler is starting college. We moved him in this past weekend and his classes start today. I miss him already!! On his dorm floor, the laundry machines accept quarters only. Tyler has been saving his quarters for 6 years - so he has a couple!! I wanted to make him a container to keep his quarters so it would be handy to him, yet able to be tucked away from others. I took a spaghetti sauce jar and peeled off the label and I ran it through the dishwasher. I found this saying on the Silhouette Online Store and cut it out of a scrap piece of navy blue vinyl. Here is Tyler settling in. Here we are saying good bye! My 3 boys. The car was awful quiet in the back seat when we left.....no fighting or bickering. That is when it hit me that Tyler was not with us. We miss him, but he is only 1 hour 45 minutes away. At least I know he should never be without the means to clean his clothes!! Welcome to the Wild Side!!! We are walking on the WILD side and hope you join us!! In this blog hop you will see lots of animals along the way. You should have come from HERE. If you found me first, hop on over to LISA'S BLOG so you don't miss anything. There is also some blog candy, so make sure you comment along the way too. Information about blog candy is at the end of this post. We live near Omaha's Henry Doorly Zoo. It is an amazing zoo if you ever are close to Omaha or Council Bluffs, IA be sure to stop on over!! Once a year, they have special events for Members Only. We were waiting for the Jaguar training session and behind us was bear canyon (which is down a big hill from the Jaguar exhibit. 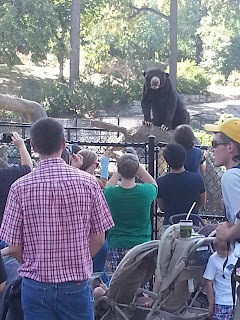 A black bear climbed up the tree to see what was going on behind him - which put him close to eye level with the crowd!! You can see here just how close the bear was to us!!! I took a couple of photos with my cell phone (did not bring the BIG camera this trip) and was kind of freaked out!!! 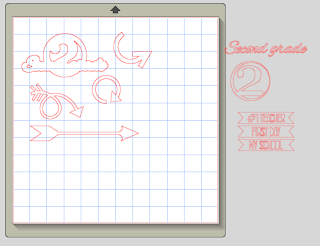 Of course I had to make a layout! I used the bear shape as a background piece and cut it out of black cardstock. I used a font from my computer for "hello BEAR" and the border Wild Animals and cut them out in brown cardstock. 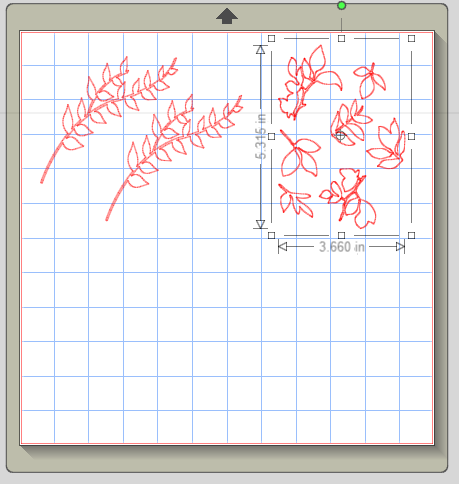 I used these two leaf cuts and cut them out in two different green cardstock papers. Here is a sneak at my title and the leaves. I layered the leaves and let them hang off the page. I trimmed the edges. Here is the bear peeking out from behind the photo! I got a new toy - a Zink!! It is an inkless mini printer that prints photos from your cell phone and tablet. I forgot my big camera and before my Zink I hardly printed off any pictures (successfully anyway) from my cell. These 4x6 photos were posted to FaceBook, then copied and saved to my computer and sent in to Shutterfly. The print quality of the 4x6 is not as good as the pictures I took with my Nikon D40 and printed from Shutterfly. It is such a pain to get these printed off!!! And......with my Zink I may be able to actually do Project Life!!! I take several pictures every day with my cell phone, but not my big camera! I hope you had fun visiting my black bear friend at the zoo!!! Now onto the Blog Candy!!!! Be sure to leave a comment on each blog for a chance to win!!! Here is the complete lineup in case you get lost (or distracted by cute animals) along the way!! !